← Latest ET stats. Nothing to see, move along. No, it wasn’t the report we #ukemplaw nerds have been holding our breath for. We are still waiting for the Ministry of Justice’s report of its post-implementation review of the justice-denying employment tribunal (ET) fees introduced in July 2013. But on 20 June, at the start of a quiet news week, the Justice Committee of MPs finally published the report of its own inquiry, launched last year, into the impact of the fees. In coming to a judgement about the impact on access to justice of employment tribunal fees, we consider, on the weight of the evidence given to us, that Mr Vara’s heavy reliance on the figure of 83,000 cases dealt with at Acas early conciliation to support his contention that access to justice has not been adversely affected by employment tribunal fees was, even on the most favourable construction, superficial. Those cases cannot be simplistically assumed to represent displaced cases which were settled satisfactorily otherwise than by being taken to tribunal. In calling for the fees to be “substantially reduced” as well as for reform of the fee remission system, the Committee recognises that this “would have cost implications for the Ministry of Justice”. However, the Committee stresses – repeatedly – that “if there were to be a binary choice between income from fees and preservation of access to justice”, then “the latter must prevail as a matter of broader public policy”. All good stuff, then, and the Committee’s members and chair, Bob Neill, deserve praise for their work. That said, I would have liked to have seen a bit more analysis by the Committee of the Government’s arguments to date, and especially the role that Acas early conciliation is now playing in the resolution of potential ET claims. 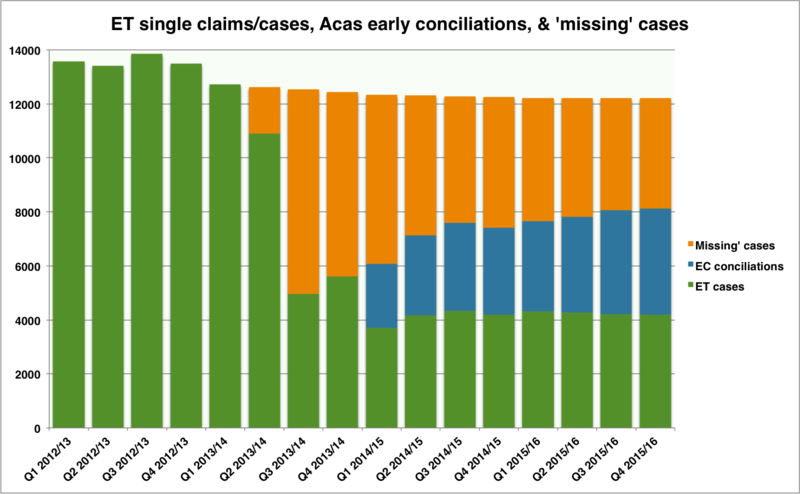 As the following chart shows, about half of the single ET claims ‘lost’ to fees are now successfully resolved through early conciliation. And, of course, not all of the other half would have been successful (at a hearing or default judgment) or satisfactorily settled. This lack of analysis in the Committee’s report was replicated in this week’s debate in the House of Commons, which focused on the Committee’s report but which, technically, was on a motion to approve the remaining £4bn of the Ministry’s £7bn budget for 2016-17 that it hasn’t yet had from the Treasury. (By convention, such ‘Estimate Day’ motions are not put to a vote, but – seemingly under pressure from backbench ‘rebels‘ such as Chuka Umunna – Labour’s front-bench eventually decided to vote against the motion). It is probably significant that, in his contribution to the debate, justice minister Dominic Raab – who has taken over responsibility for this matter from the hapless Shailesh Vara, and is perhaps most famous for having once been the Foreign Office’s in-house expert on “the international law of outer space” – noted that “there has been virtually no mention of [Acas early conciliation] in this debate”. My guess is there will will be quite a lot about early conciliation in the Ministry’s much-delayed post-implementation review report. Indeed, the emerging evidence on early conciliation may well explain much of the delay. As for when we might get to read that report, Raab told MPs that “the review is very close to completion, so I hope to be able to make an announcement in the near future”. Which, who knows, might well mean ‘on Wednesday, when everyone is looking the other way’.